At its best, colour treated hair is vibrant and well nourished, for desirable shine that turns heads. But coloured hair requires extra attention, because it can easily become dried out and damaged. 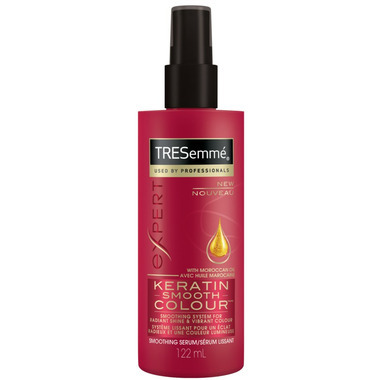 Treat your tresses right: get silky smooth style with TRESemmé® Keratin Smooth Colour™ Smoothing Serum. This keratin with Moroccan argan oil formula provides deep nourishment for dry hair. The anti-frizz formula tames flyaways for sleek style, and restores the brilliance of your colour. You're left with lightweight, shiny hair with vibrant colour. This serum is formulated with Moroccan argan oil and keratin protein and designed to provide frizz control and softness. Ingredients: Aqua, Cyclopentasiloxane, Propylene Glycol, Dimethiconol, Hydrolyzed Keratin, Sclerocarya Birrea Seed Oil, Argania Spinosa Kernel Oil, Phenoxyethanol, Polyquaternium Crosspolymer-3, Parfum, Paraffinum Liquidum, Phenyl Trimethicone, Disodium EDTA, Triethanolamine, Iodopropynyl Butylcarbamate.